Well, as a 22-year-old post-graduate working girl, I sadly bid farewell to any hopes of having a spring break last year. Luckily for me, my mother is a teacher and she has spring break, so when I found out that I needed to use up my two roll-over vacation days from last year, a mini spring break vacation seemed like a perfect solution. My mother had never been to Boston before and I had only been there for about twenty-four hours last Labor Day. It was also within driving distance of where I live (which I still can’t get over) and would help cut the costs. I drove up on Friday night so my mother and I were ready to go Saturday morning. 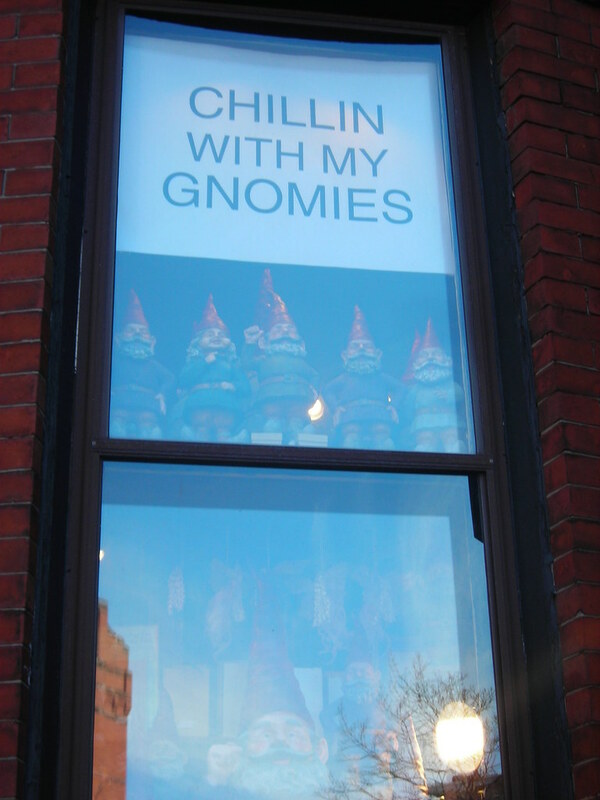 We started off on Newbury Street with brunch and window-shopping. We even found a funny window! I thought this was hilarious and I ended up buying a magnet with the saying on it too. We walked the Freedom Trail through Boston, passing through the Boston Commons, Park Street Church, the Old South Meeting House, up past Faneuil Hall and into the North End. Unfortunately, both Paul Revere’s house and the Old North Church close ridiculously early (like 4pm! What respected historical location closes then!?!). So we had to come back. We had thoughts of going to the Old North Church for Sunday Easter service, but I ended up coming down with a bit of a cold and slept in until almost 11 a.m. instead. We didn’t want to waste too much of the day, so we took a quick jaunt over to Cambridge (I waved to Massachusetts General Hospital – home of Dr. Faustman – on our way there) where we had Peet’s coffee, toured Harvard University and stopped in the Curious George store. Afterwards, we made our way over to the North End to finish up our sightseeing stops. When we got to Paul Revere’s house, there was a tour with some students going on. While the tour guide was speaking, he said to the students, “You all are from a high school in uh, in uh Portland…Portland, Oregon, right?” I thought he was going to say “Maine” because we were in Boston and you could practically throw a rock at Maine (well, compared to Oregon!). 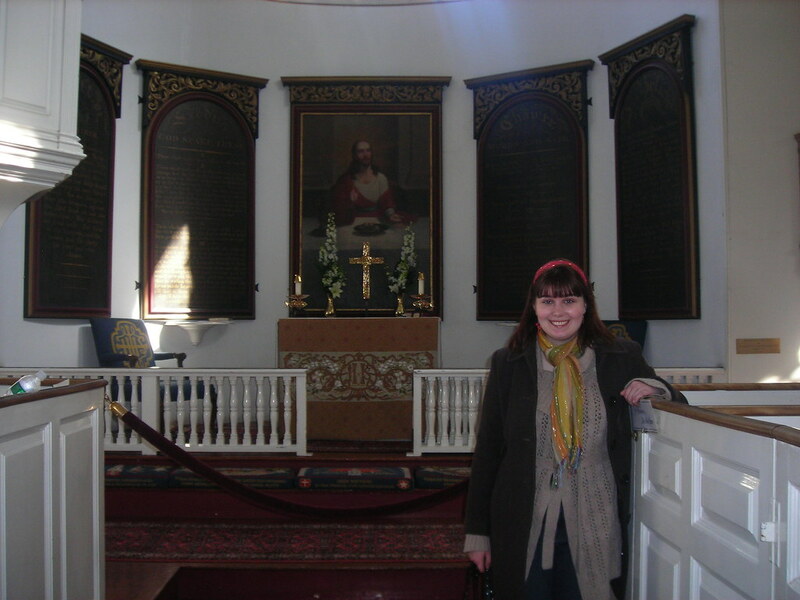 We stopped by the Old North Church and I had my picture taken with God (well, kind of). It was still early, a little after four, when we were done so we wandered around the North End looking for a place to eat. We actually stumbled upon a jewelry store where my mom bought a really great green ring (how Boston!) and I got a woven bag for the spring. On Monday we decided to skip town and we drove up to Salem. Salem was probably not the smartest decision ever considering it was very cold and nearly nothing was open, but we did tour the House of Seven Gables, Nathaniel Hawthorne’s birthplace and one of the many, many witch museums which was sadly just a retelling of The Crucible, so I found it slightly dull. 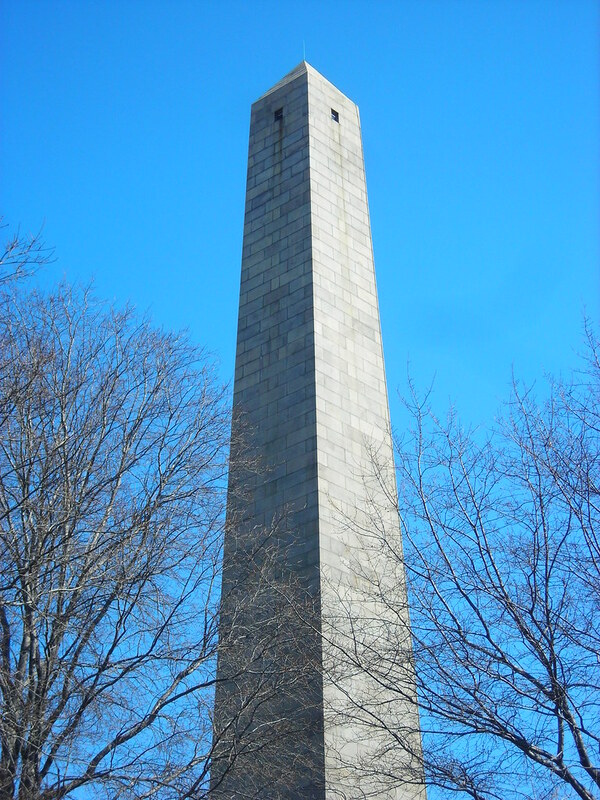 We skipped town on Tuesday, but not before heading up to Bunker Hill monument and I stupidly decided to climb to the top – all 296 steps! I have climbed to the top of Notre Dome (yes, it’s possible to climb to the very top of it), and I’ve been to the top of the Eiffel Tower and the Sears Tower (albeit via elevators – thank God). Somehow it’s been ingrained in my psyche that I absolutely must climb to the top of whatever monument I’m near, which isn’t so great considering how out of shape I am. Wednesday was my mom’s final day and we spent most of it just sitting around my apartment. In the afternoon, we went to the city for dinner at my old favorite, Cibo (those of you who attended OCapalooza last year will remember Cibo) and then we rushed over in very heavy traffic to see A Chorus Line. It was amazing! 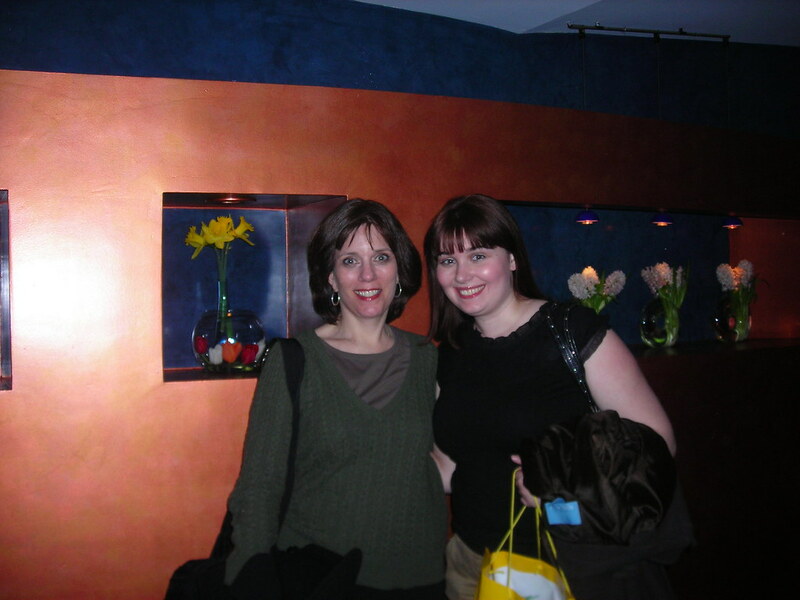 I have seen quite a few Broadway shows, but each one are so different than I have a hard time picking a favorite. This is definitely a fun, yet touching look at what an actor goes through on Broadway and I have much more respect for those who pursue show business. My mom left yesterday morning, so now life has finally returned to somewhat normal. I am way behind on most of my freelance projects so other than running a handful of errands I plan on staying put in my apartment and taking care of what needs to be taken care of. Won’t be very relaxing, but at least I’ll get some of the stress off my plate! You can check out all my photos from spring break on Flickr. That’s the horrible truth I learned when I first started working! There are no spring breaks in the office! (Though that doesn’t mean we can’t have a little fun, right?) Awesome photos! I loved reading about your trip through Southern New England. There’s no shortage of cool places to visit (when they’re open!) up in those parts. Hey – I found you on 20somethings – sounds like the trip went great! Do you get to travel much? Jeff: I definitely love New England I hope to spend more time up north this summer… hopefully I’ll break past MA and get into NH or VT.
Kate: I try to travel as much as I can, but being a working girl it can be tough. I definitely did a ton of traveling last year – spent a week on the East Coast (CT, NYC, NJ and PA), a few days in California, then moved out here, went to Philly, Boston and D.C. in the late summer/early fall, and then in December went back to Oregon and California. This year trips include a trip to Oregon for my brother’s HS graduation, a trip to Florida for a diabetes conference, and possibly a trip to London though that’s not a for certain. Isn’t Boston amazing? What buildings did you see at Harvard? I spent most of my time in the Science Center and Johnson Hall when I was up there for debate in Feburary. My school also went to Yale earlier this year, but I didn’t go because I had only been competing for about 2 weeks and didn’t feel ready enough to compete. But Harvard’s cool, I got my national ranking there…. And I agree, The Scarlet Letter…..one of the worst books I have ever had to read in school. Got a solid 36% on that test. The only time I have ever failed a test in English. Jamie: We actually just walked around the outside and around Cambridge. We didn’t go into any of the buildings because it was spring break for the campus. And yes, I have a “little” brother… he’s actually 4 inches taller than me though. I’ve written about him a couple of times, and you can see pictures on this blog and also on Facebook and Flickr. But I don’t typically write about my family unless I’m doing something with them. NO, you are confused Anne of Green Gables…. Canada, that still further north I think it’s like Halifax, nova scotia. You were at the house of seven gables, sorry, I AMA teacher in. 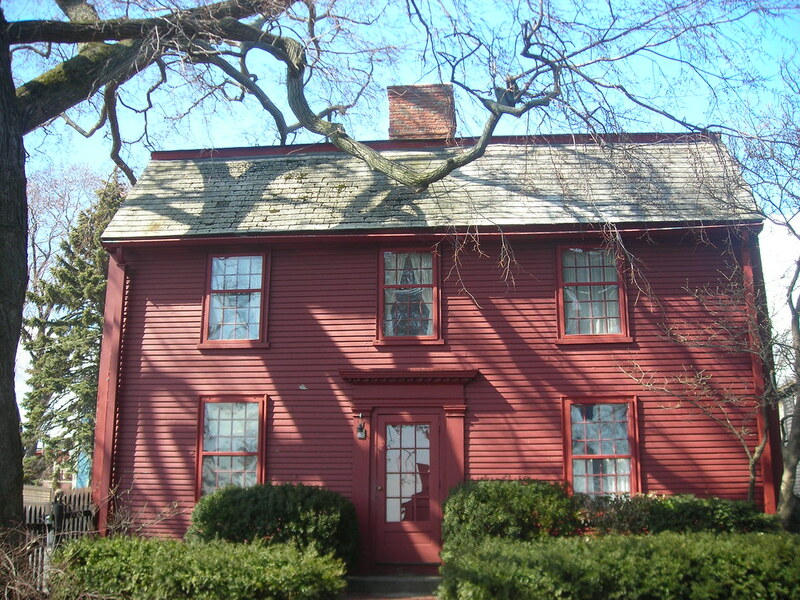 Salem ma and I live right next door in Marblehead, where you should definitley go if you ever wander north again! Cate: I’m so sorry! I can’t believe after touring the darn thing I still wrote it wrong! I fixed it! Thanks for pointing it out. I will definitely check out Marblehead the next time I venture to New England again. Salem was beautiful, very cool place you live.